Today's post has been a long time in coming... A year and a half in fact. So be prepared for a picture/word heavy post!! 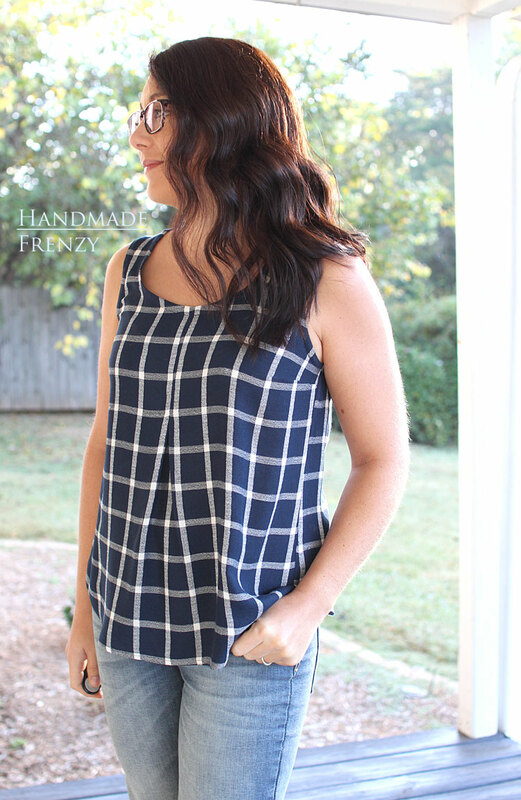 I made my first Southport Dress Tank Hack back in May of 2016. Obviously I became obsessed, because I just finished up my 5th and 6th version! And this doesn't include my dress version that I made way, WAY, back in 2015! You can read that post HERE. You can find the tank hack tutorial is on True Bias's blog HERE. Since making the first dress version, I've made a few fit changes to the pattern. The only cosmetic change I've made is to raise the neckline 1 1/2", I also changed the neckline curve to be more rounded in versions #3 and #4, but changed back to mirror the pattern for #5 & #6. Looking at these photos above, however, I will be going back to the more rounded shape from here on out. For some reason, the squared off curve tends to gape on me. I'm sad about this, because I love the shape of the squared off curve. 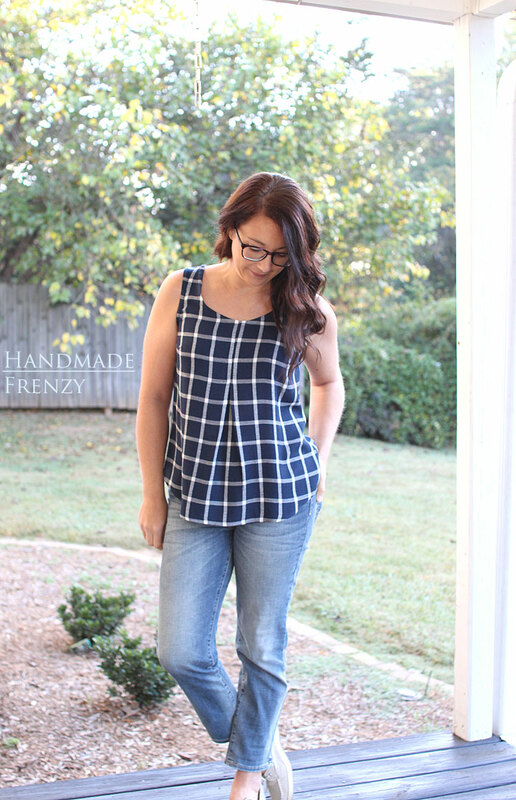 I had been meaning to blog about these tops as I went along, but the truth is that each time I made another one, it just integrated itself into my wardrobe rotation so quickly that I never took the time to properly take photos and blog them! If you follow me on Instagram ⇐click to follow!! (if you don't, I'd love to hang out with you there!! ), you know that I wear these tops ALL. THE. TIME. Multiple times a week. 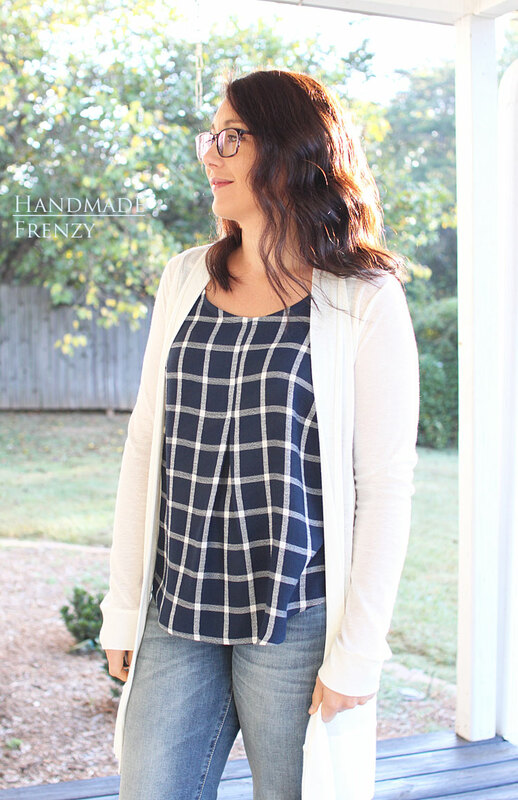 They are perfect for wearing alone in the summer, the coverage is exactly what I look for in a tank, and layering them with one of my many cardigans is just my favorite thing. So I'll go ahead and take you on a run down of each one that I have made, in chronological order! 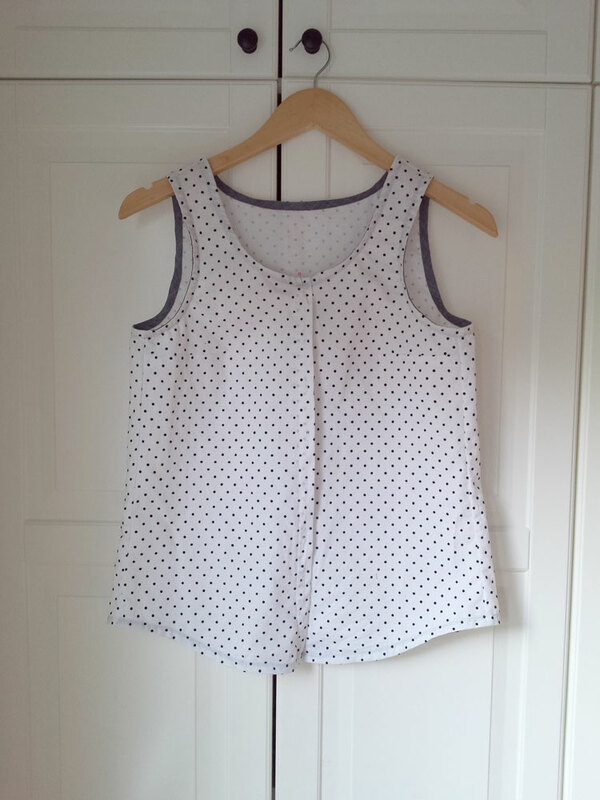 This polka dot version is the very first tank version I made (and actually photographed in May 2016!). 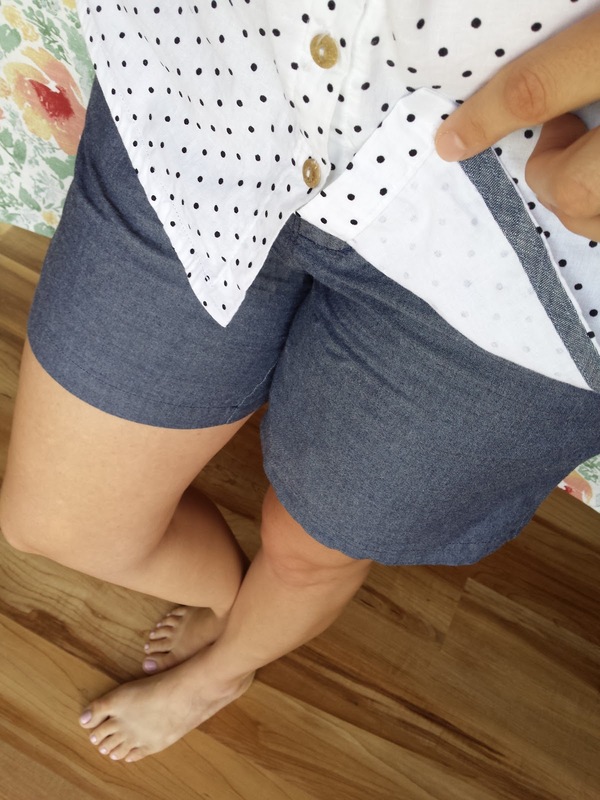 I used a rayon challis from Joann and did a center pleat rather than the button down placket. This was a super simple mod, just cut on the fold rather than in 2 pieces and sew a 6" long inverted pleat down the center. I love the swinginess this gives the front of the tank. This tank was a bit big in these photos, and made me very self conscious when I bent over in public while tending to my kids. As it happened, it got thrown in the dryer by accident one day, I nearly had a heart attack when I pulled it out because I assumed it would have shrunk beyond hope. (I don't dry my rayons, ever, even in the prewash) But, instead, it's still 100% wearable and maybe even fits a little better! Bonus is that there is no longer any neckline gaping. Yay!! Haha. I did a rolled hem on this polka dot version. 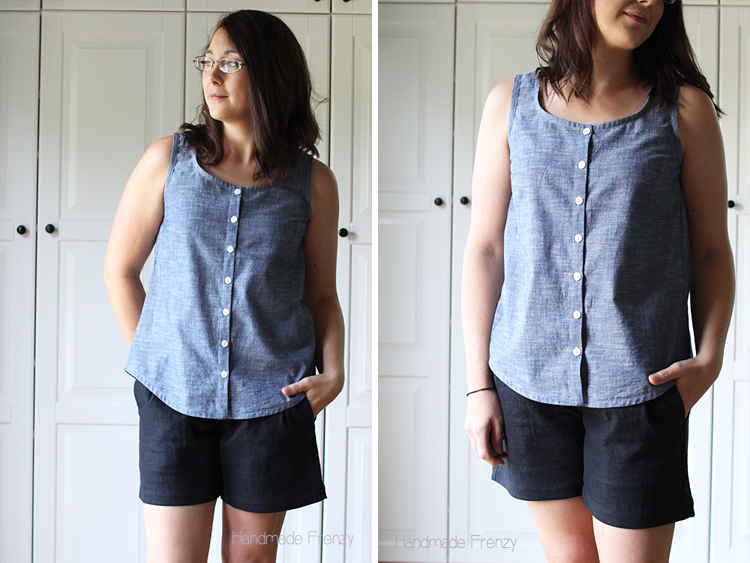 Tank #2 was made in a chambray (of sorts), also from Joann. This version is blogged in detail HERE. I also like being able to tie these up at my waist if I want to. Especially with the high waisted styles currently! 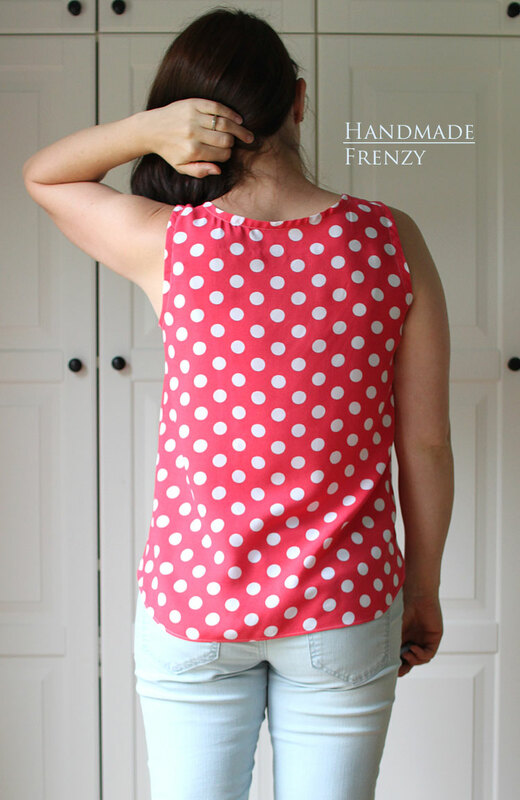 Tank #3 was made in a frenzied pre-vacation sewing binge. You can see more on that HERE. I did not blog this version and also don't have great photos, but on this version, I took out some width from the center front (which ended up being too much) and rounded the neckline. I also finished the hem line on this with bias tape as well. I find I really like using the bias tape method to hem tops with a shirt tail hem! 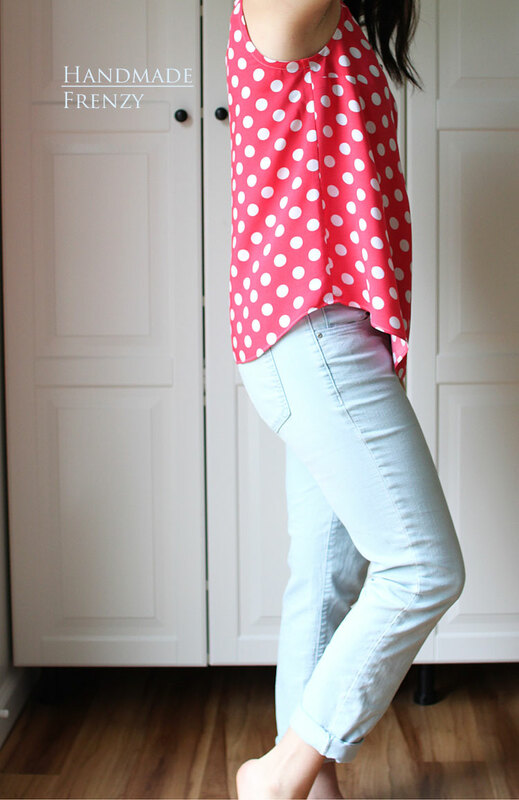 I used a cotton shirting with flocked black dots from Joann's for this version. The 4th version of this pattern I made late this summer. 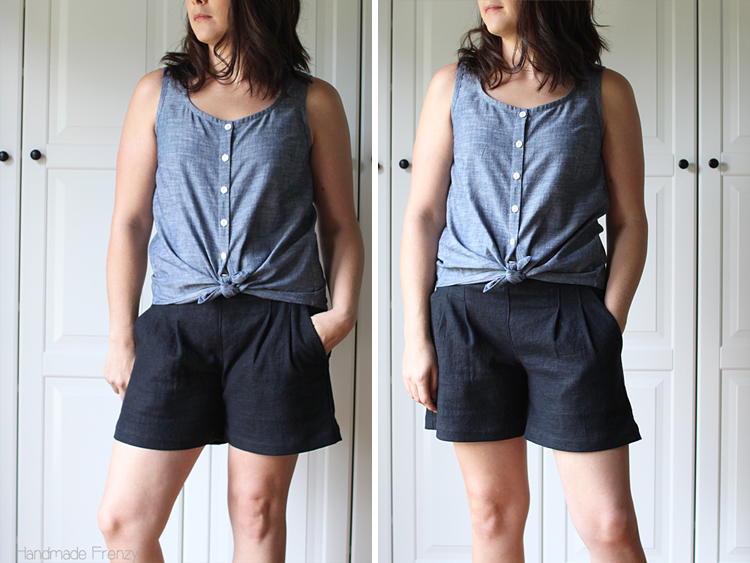 I used a linen/rayon blend, also from Joann's, that had been languishing in my stash for quite a while. 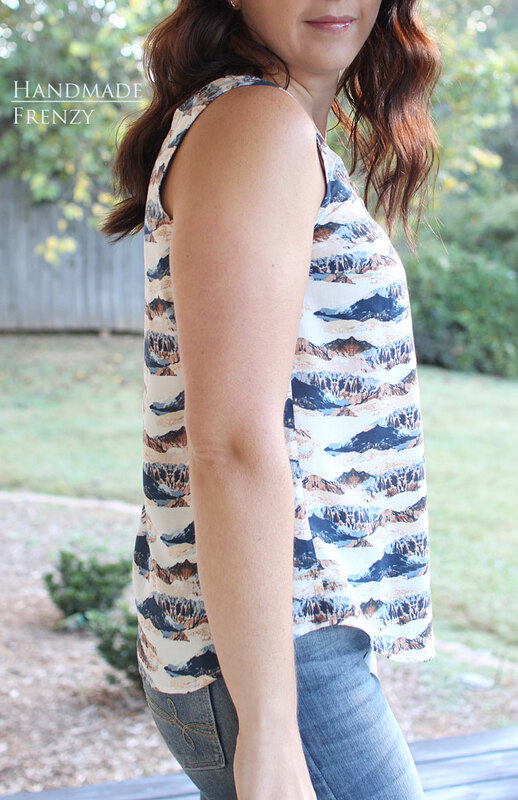 Haha, I just realized the first four tanks I made were all in fabrics from Joann! I really, really love the drape and weight of this one. For this tank (and #5 & #6) I did a 1/2" swayback adjustment and it helped with some of the "poofing" I was getting at my lower back. This one also has the more rounded neckline. I love wearing this one, the fit is the most perfect of all of them in this rendition. I plan to immortalize the tweaked pattern with this exact version on to poster board, lol. Once you've got a good thing, you have to preserve it! 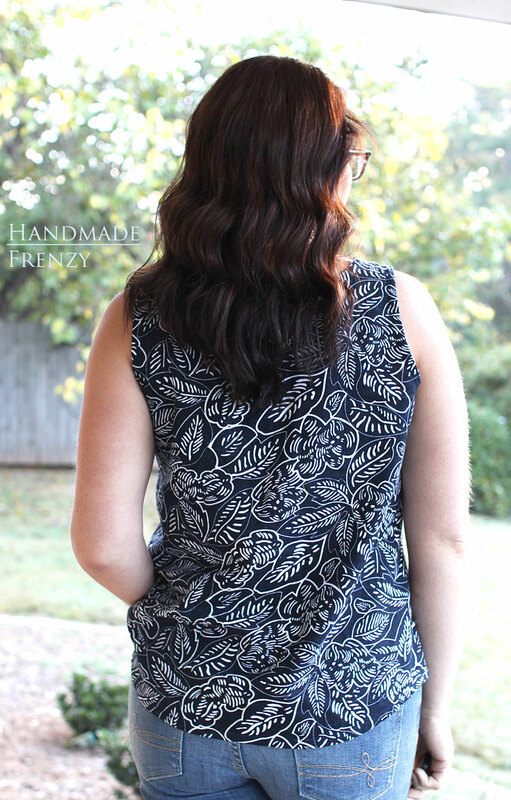 The hem on this tank is finished with bias tape. The next two tanks were made last week, in preparation for this post! 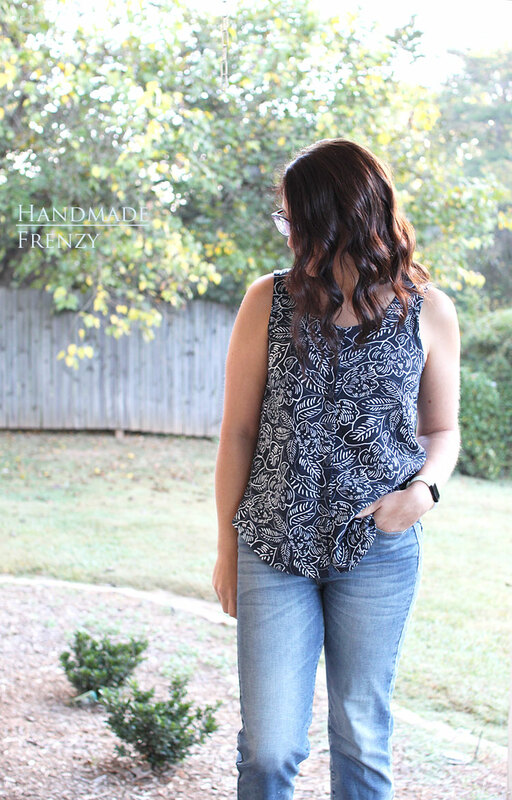 I thought since I had the fit perfectly tweaked, I needed to make two more in these gorgeous fabrics I picked up over the summer. Bummer is that I made a minor change to my "perfect" pattern and now I'm getting that dreaded gaping at the neckline. However, in my experience with tanks #1 & #2, that gaping relaxes over time, so fingers crossed!! 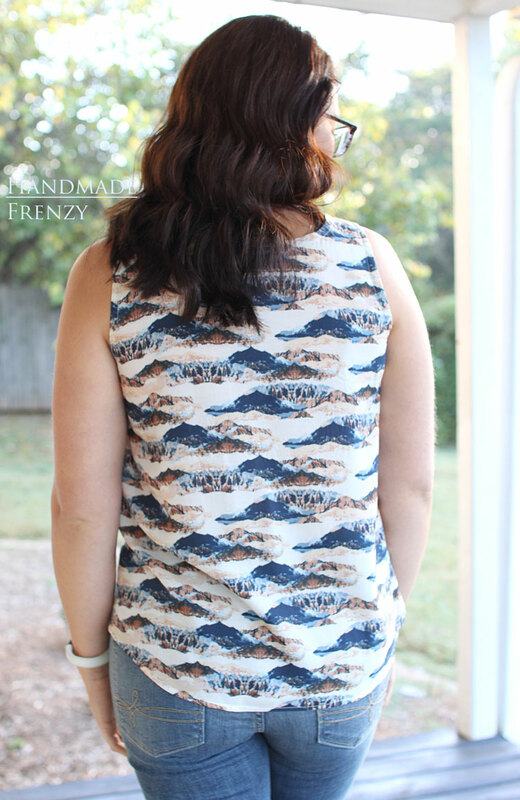 Tank #5 was made in AGF Heritage Rayon by April Rhodes, this print is called Mountain Mirror. 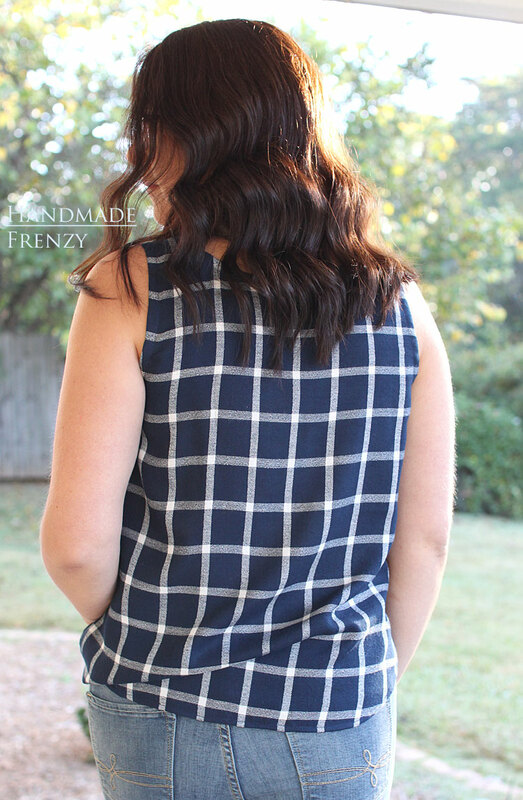 I purchased this fabric from Imagine Gnats this past summer, still available HERE! I was dying to make a tank from it and it definitely fulfilled all my mountain wearing dreams. 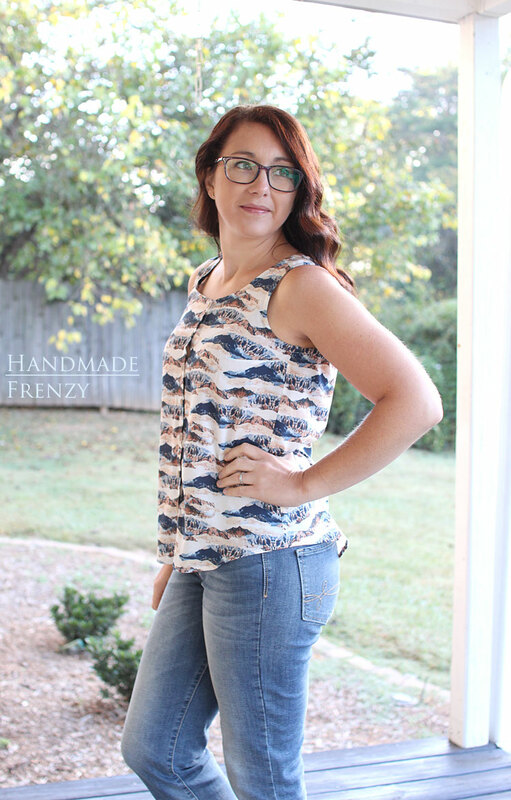 This tank turned out to be the most close fitting of all the tops I have made. I'm thinking this must be due to the fabric having less give. Although, I won't rule out the possibility that I cut it a wee bit smaller during the cutting stage, since rayon challis can be a shifty beast. I also did not try it on at all during construction because I thought I had it perfected. Lesson learned. I could have let the seams out a smidge or shifted the buttons a little further apart to give myself more room, but alas, there are french seams throughout, and who wants to redo seven buttons?!! I did a scant 1/4" double folded hem on these last two versions. It's hard to say which of these is my favorite, but this windowpane rayon is definitely up there in the favorite fabrics category. Also, the pleated front (like #1) is a fun change from the placket versions too. 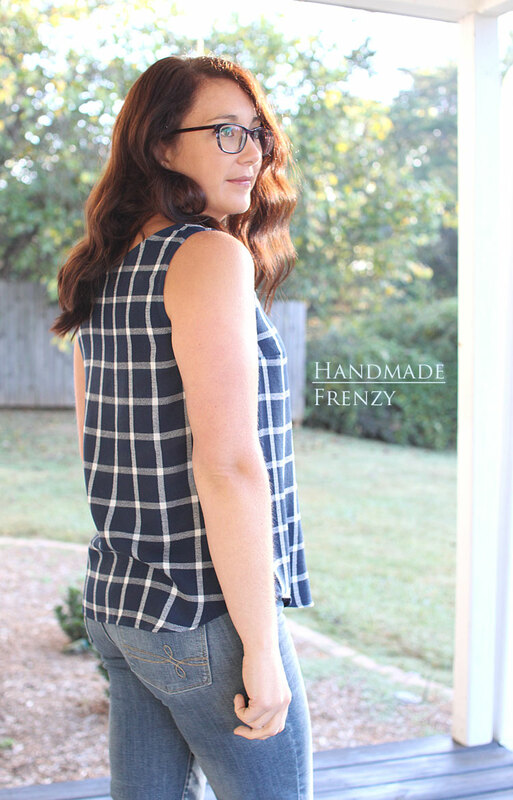 The window pane rayon is from IndieSew over the summer, which is sadly now all sold out! I absolutely love the drape and flow of this one!! It feels great and looks great too. Plus the fabric... Just gush, gush, and all the heart eyes! 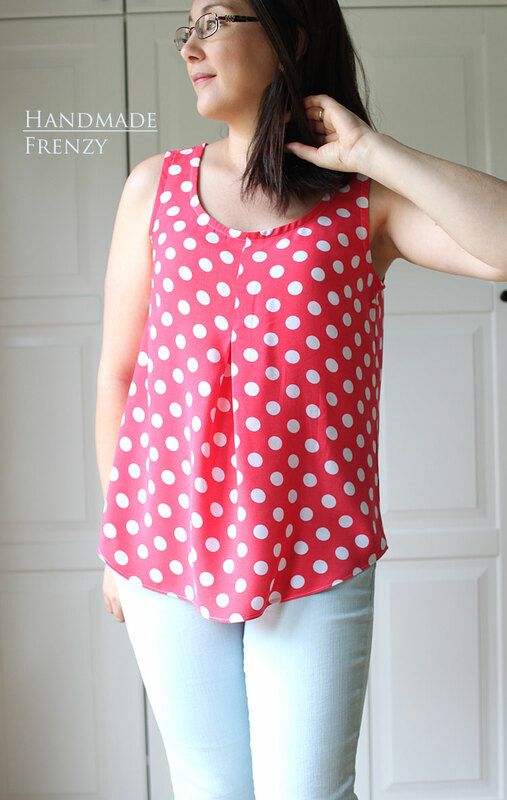 It has a crepe texture that is just to die for and fun change from the typical smooth texture of rayon challis. 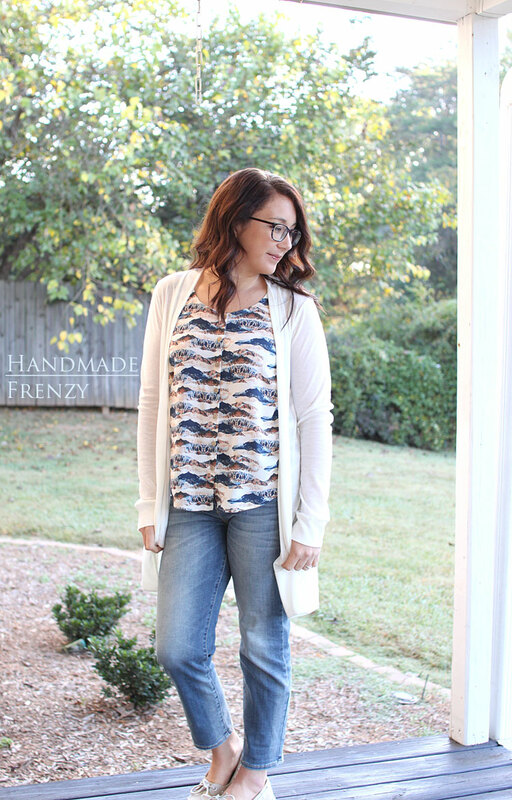 I couldn't leave this post without showing you a few views of it paired with a cardi! Which is hands down my favorite outfit these days. 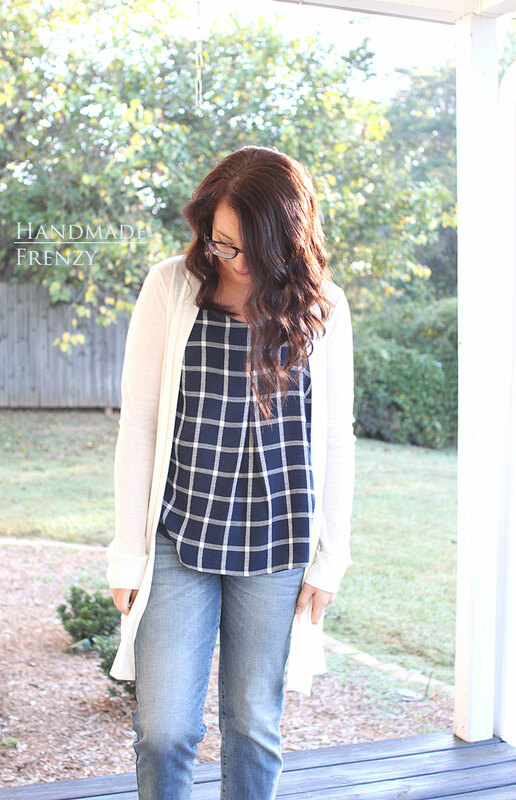 This new cardi make, Blackwood Cardigan is also my new favorite cardi pattern! 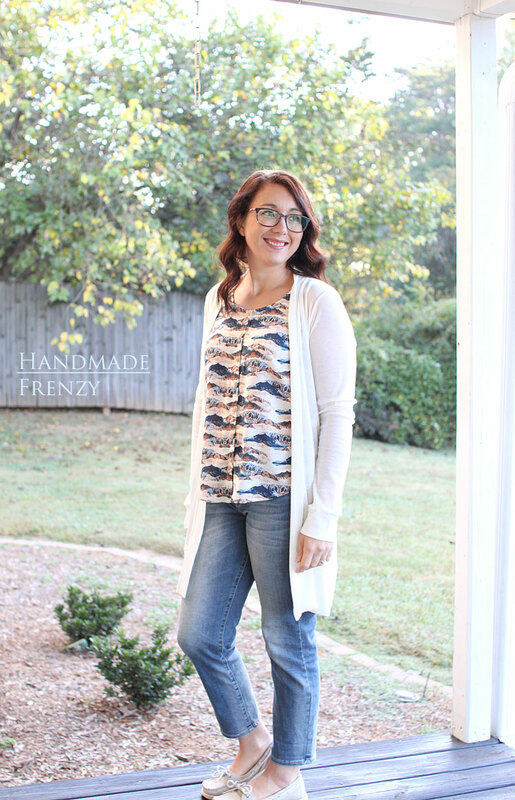 Seriously, if you love cardigans as much as I do, you need this. You NEED this. I LOVE the sleeves. They are a slim fit, so I actually prefer to wear it over tanks rather than anything with sleeves, so yay me! I have 6 Southports to choose from!! 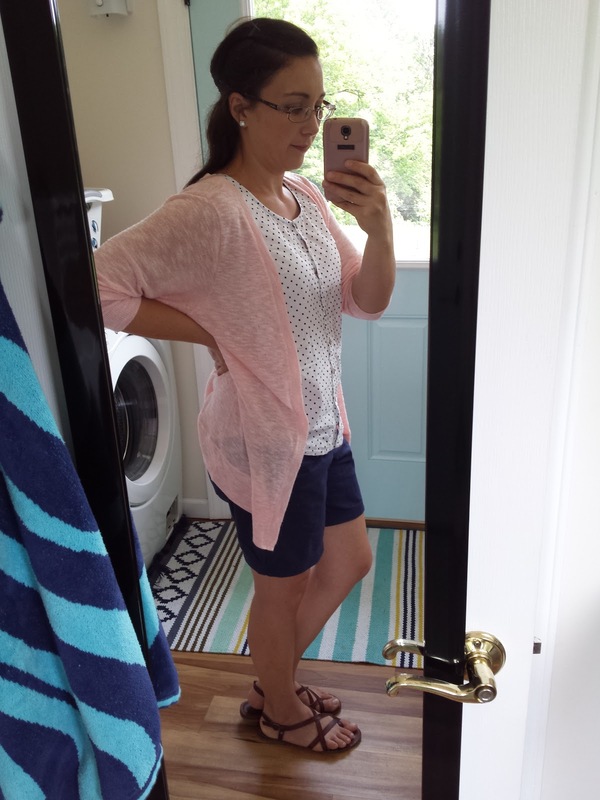 This cardigan is made from a sheer knit, also from Joann's. 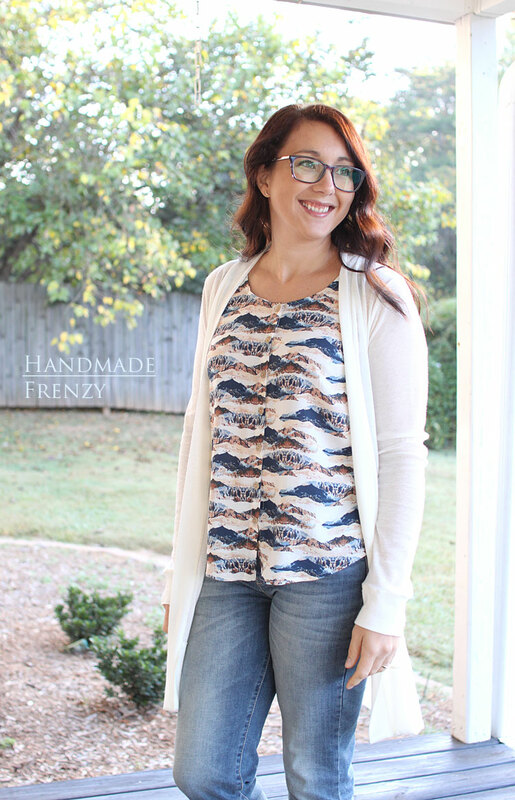 Even though it's sheer it adds a nice layer for fall weather. My next version however, is going to be the same color, but in a fabulous stretch french terry. That will take these tanks through the winter for me!! Thanks for your post. I have been looking high and low for a good tank pattern. With your thoughtful changes this one looks like a winner. I love a great basic pattern. I will have to try this hack someday!